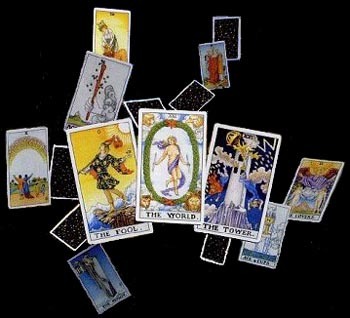 Cards are read by a combination of the numerical language, and the meaning of the suits which give a value to each card, which combined with the cards on either side, make up a sentence and then a story. This is followed through with psychic connection to find the true answers to your questions. Each card has well over 32 meanings, this combined with the 78 cards in the pack mean that there are many many possible combinations which can give wrong answers if followed. However the answer is always in the cards, as long as they are respected, and valued. 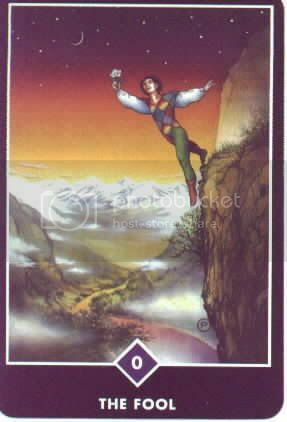 This card begins the Major Arcana story, and shows a man dressed haphazardly, or in fairly ragged clothes,carrying all of his belongings on a stick and walking in a daydream; with one foot on solid ground, while the other is about to step over a precipice. A dog bounds around him (sometimes chewing on one leg,) leaving him unconcerned. He seems in his face to have the look of one who has not a care in the world. 3. Do something spontaneous,without a concern for the outcome. 5. Dont think too hard. 7.You are taking a risk, but it may be worthwhile. Pulled as a single card for a daily reading,this would generally mean. "Give yourself some time and space, doing something spontaneous,which you would not normally do.You need to find your inner child."